As hard as I try to keep them completely separate in my head, for reasons I’d rather not explain, Seanan McGuire and Mira Grant are obviously one and the same. 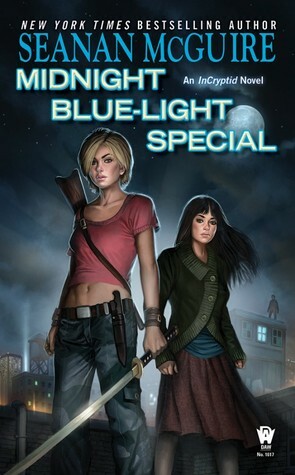 Midnight Blue-Light Special, like no other book published under Seanan’s name before it, shows the sharpness and wit I’ve come to associate with the brilliant and irreplaceable Mira Grant. The urban fantasy genre itself may be a bit constricting compared to a post-apocalyptic future one can create from scratch, but Seanan found a way to make the best of it. The worldbuilding in her InCryptid series is exactly what urban fantasy should be: rich, imaginative and never before seen. As always, McGuire paid so much attention to even the smallest things. The world of cryptids is a never-ending source of fascination and amusement, with creatures such as bogeymen and dragon princesses described in painstaking detail. Bogeymen have extra knuckles, the better to creep you the hell out when they grab your ankles in the dark. It makes shaking hands with them a little bit disturbing, since it feels like you’re breaking fingers no matter how many times you adjust your grip. In Midnight Blue-Light Special, the mighty and powerful representatives of the Covenant of St. George, not trusting the reports they’ve been getting from Dominic, decide to come to New York to do a purge. In other words, they plan to storm the city and kill every Cryptid in sight, and Verity right along with them. It’s time for Dominic De Luca, who was raised to be a Covenant boy through and through, to choose a side and stick with it. Although it never took over the plot, romance was very much an essential part of Midnight Blue-Light Special. I loved the absolute honesty between Verity and her hot Covenant boy Dominic De Luca. They were raised (by the Prices and the Covenant of St. George, respectively) to be bitter enemies, but still they fell in love. So when the time came for Dominic to choose between the Covenant and the girl he loves, he was very honest about it from the start. He never claimed to have made up his mind until he really did, and this allowed both me and Verity to respect him even when they were seemingly on opposite sides. When you decide to be the immovable object standing in front of the unstoppable force, you’d better pray that you’re right about being immovable, and they’re wrong about being unstoppable. Although witty and imaginative, Midnight Blue-Light Special was by no means without problems. The sudden change in perspectives in the second half came as a complete shock, and while I understand McGuire’s decision to show us some events through Sarah’s eyes, I wish she’d chosen someone else. I never really cared for Sarah, and not because I harbor prejudices against cuckoos, but because I always thought of her as weak and indistinctive (her cuckoo powers aside). Secondly, the pacing was all wrong when I expected better, especially from an author of McGuire’s caliber. Oddly enough, the first half was better than the second, at least in terms of pacing. In the second half, there were scenes that went on forever when they could have been cut in half without damaging the story, and the final big scene happened too quickly, forcing me to go back to reread because I failed to understand everything the first time. However, all things considered, Midnight Blue-Light Special is undoubtedly worth your time, if only for its fascinating worldbuilding and refreshingly honest characters. Seanan McGuire’s crisp sense of humor certainly helps push through those scenes that are unnecessary to the plot. Plus, there are the talking mice. Did I mention the talking mice? In the next book, we’ll be leaving Verity behind to join her brother, the cryptozoologist Alex Price, on one of his many adventures. It’s a risky move for Seanan since we’ve heard about Alex, but never actually met him, but I’m confident she’ll make it work. And besides, Verity deserves a break, doesn’t she? Cuckoo powers? (Um...I had to look back at your post to spell "cuckoo" correctly. Pitiful. My spelling powers have degraded!) This world sounds incredibly intriguing! I know I've seen this series around and recognize the name...I wonder if I have the first one on my shelf (god, where is my brain today?!?). If not, I'm going to have to check it out! Talking mice you say? Consider me convinced! ;) Despite the flaws here, I quite like the sound of this. Well, minus the perspective change half way through... I imagine that's something that might annoy me, especially if I don't care for Sarah any more than you did. I'll have to give the first one a try one day. Great review, Maja! hmm this one sounds like it let you down a bit. I totally know where you're coming from. I am always a little nervous when I read a book from an author that I adore (like you do Grant) there is just so much that could go wrong! I'm happy to see that despite the pacing and perpective issues you did enjoy it overall though! It is always hard not to associate an author's work from another sometimes isn't it? I had that same problem when starting Darynda Jones' new YA series. I am glad you liked this one and the world building was excellent, that is so important in this genre. I really loved the first book in this series, and I actually enjoyed this one more than you did, I think. That said, I was also a bit thrown by the sudden POV changes. I suppose that was to set up the next book in the series? I'm not sure, but I will continue reading. Also, did you know that she has several free short stories/novellas set in this world on her webpage? If you enjoyed the books you might want to check them out! I haven't heard of this series before Maja! I gotta say though, I love the sound of the relationship between Verity and Dominic, I have a thing for forbidden romance. And bad boys. And best-friends to lovers. I have a lot of things okay? :) I'm in the mood for some refreshingly honest characters, thanks for putting this one on my radar! Honesty is a good thing in a relatiosnip and good to hear that seems to be driving their romance in this book. Interesting... sounds like the author is really good with description and details, which contributes to the book in general. I have not read the series myself :) but it sounds like the romance in this book is interesting. Oh as soon as I saw who wrote this a few months ago I knew I had to read it. Seanan is obviously a fantastic writer no matter what name she uses. I love how this setting seems to really come to live with the great imagination and descriptions she dishes out. It's odd how she used new POvs abruptly though, but I've noticed I often love alternating POVs more than some so it might not be much of a bother. "not because I harbor prejudices against cuckoos," LOL. OMG. Mira Grant's Newsflesh Trilogy is among my favorite books of all time, and I'm so glad to here that this series compares in the writing and wittiness. Doesn't sound like it's as good, but I definitely need to get to her McGuire books, though I've got my expectations a bit lowered from her more epic, science-based Orbit books. Oh this one sounds like so much fun. I've been gathering Seanan's October Daye series so I can read them back to back and it looks like you have put another book of hers on my radar. You also had me at cuckoo powers and talking mice. Too bad you didn't love Sarah, but now that I'm warned, perhaps I'll deal with it better. The sound of the unique and imaginative world building makes me want to read this book even though you mentioned issues with the pacing and sudden change in POV. I feel like I haven't read one good book that completely blew me away in a very long time. Maybe I should give this one a shot and see how it goes for me. OK, I feel like the queen of ignorance, because I had no idea Seanan McGuire=Mira Grant! I knew Mira Grant was a pen name, but I never bothered to look into who was behind it. *mind blown* I adore the Newsflesh series, and any book that comes close to the witty, intelligent writing and worldbuilding in that series—especially one written by the same author—is a definite must read for me. Plus, talking mice? Oh, this is happening! Off to find the first book for my kindle. Fantastic review, and thanks for enlightening me! Well dang it! I was expecting you to love this more. I really want to try this series. I am disappointed that the pacing is off, that is usually a big deal to me, I can get through pacing problems for good world building. I like that this is witty, too. I will just have to jump in and read this soon. I so wanted to start this series when the first one was released. Now look at me, still wanting to start the series after the second one. *sigh* I have to get caught up with all this authors work. Thank you. I really like the unique cover of this, it doesn't have that same look of so many other urban fantasies. This series sounds pretty great too and I'm not so sure it's been on my radar yet. I know the author is one I have heard a lot of good things about though so I'll have to think about reading her books soon! I'm not exactly a fan of the cover, Maja, but I really like the sound of the romance. I think it's awesome that Dominic takes his time making up his mind as to whether he'll choose love or duty. I find that characters too often pick love but it feels like that's just what they're supposed to pick and their choice isn't really justified. I remember reading your review of book one and thinking this sounded like an interesting series. I like the sound of Verity and Dominic and can understand you not being able to enjoy the change in POV, it's a shame when it changes to an unliveable character. I hate when authors write with different names. I understand why, but I always lose track of their work when they do this. Granted, I haven't read her books as Mira yet, but still. I need to read Feed soon anyway, so I'll read that before considering this series. This sounds good, but I know so many love Feed.